Pad thai is not only easy to make low-FODMAP, but it's easier to make at home than you might think. Once you get the hang of it, you'll prefer your homemade version over takeout - no more greasy noodles mixed with a few skimpy shrimp. My recipe has plenty of healthy protein and the sauce adds tons of sweet-tart flavor. Psst! 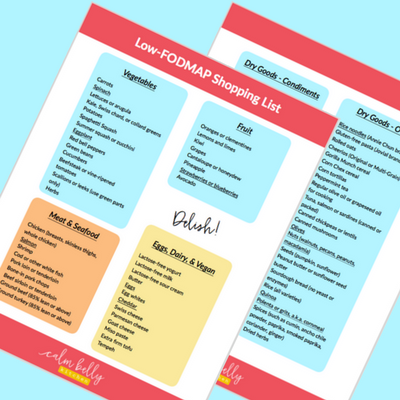 Just getting started with FODMAP? Click here to join the FREE 7-Day Cleanse & learn to feel better fast! Pad Thai noodles are a classic, but the cantaloupe salad is my own invention. It's cool, refreshing, and a nice change from lettuce. You can serve both dishes together as a full menu, but sometimes I just make the Pad Thai. The recipe has a lot of components (sauce, noodles, protein, eggs, garnishes...whew! ), but once you start cooking it comes together FAST. Have all those ingredients ready to go! Have you ever made Pad Thai? 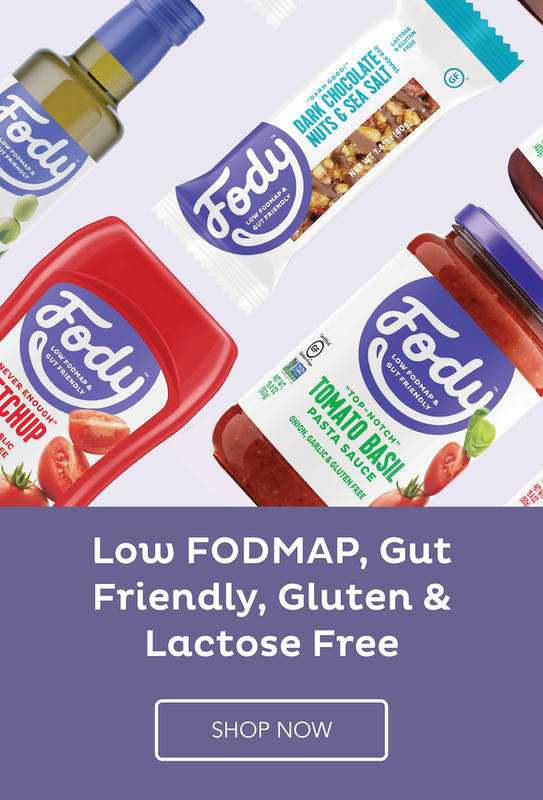 What other Thai dishes would you like to make low-FODMAP? Leave a comment and let me know! I use a very large (13-inch) straight-sided saute pan for this dish (this one specifically). If you don't have a saute pan or wok large enough to fit all the ingredients, add the chicken and shrimp mixture to the large pot you cooked the noodles in and proceed with the recipe from there. There are substitutions for tamarind concentrate, but none of them will give you the uniquely tart, fruity flavor. You can buy it in ethnic food stores or online here and here. 1. In a small bowl or glass liquid measuring cup, whisk together the tamarind concentrate and hot water. Add the fish sauce, lime juice and sugar. Whisk until combined and set aside. In a medium bowl, beat the eggs and season lightly with salt and pepper (fish sauce is high in salt, so season conservatively); set aside. 2. Meanwhile, bring a large pot of water to a boil. Add the noodles and cook until al dente, 3 to 4 minutes (or according to package directions). Drain in a colander and rinse thoroughly with cold water. 3. In a large sauté pan (see recipe head note), heat a thin layer of oil (or use cooking spray) on medium high heat. Add the chicken, season lightly with salt and pepper and cook, stirring frequently until cooked through, 4 to 5 minutes. Add the shrimp and stir until just heated through, about 1 minute. 4. Reduce heat to medium and push the chicken and shrimp to the edges of the pan. Add about 2 tsp of oil or mist the center of the pan with cooking spray. Add the eggs. Cook until just beginning to set (reduce heat if eggs are cooking very quickly). Start breaking the eggs up with your spatula; you should still have some runny/liquid bits at this point. Add the noodles, 1 cup of the bean sprouts, half the peanuts, half the scallions, and half of the cilantro. Gently fold all the ingredients together until eggs are set. 5. Give the tamarind mixture another quick whisk and add to the pan. Stir until combined and most of the sauce is absorbed (sauce will continue to absorb as pad thai cools). Serve immediately and garnish with remaining bean sprouts, peanuts, scallions, cilantro and lime wedges. I bought a Thai basil plant this year and that's what I used, but regular basil or mint (or a combo) would be just as tasty. 1. In a large bowl, combine cucumber, carrots, cantaloupe, bean sprouts and shrimp. In a small bowl, whisk together lime juice, soy sauce, fish sauce and brown sugar. 2. Add sauce and chopped herbs to salad mixture and stir gently to combine. Best served right away; may be covered and refrigerated up to 1 day.